THIS IS THE FORCES OF VALOR 82010 U.S. AMPHIBIAN GENERAL PURPOSE VEHICLE (GP). No ties or screws for 2013 new packaging, double blister construction. After having commissioned auto manufactures to build the first 4,500 jeeps (GP’s for General Purpose which was commonly called “jeep”) the US Motor Transport Board set up a project under the direction of the National Defense Research Committee (NDRC) to be designated "QMC-4 1/4 Ton Truck Light Amphibian" which became “GPA” of jeep amphibian. The War was at full tilt, and with bridges over Europe's rivers being taken out one after another, it seemed practical if the jeep could swim as well as drive. The GPA's design was based on the standard jeeps as much as possible. The GPA had an interior similar to that of the MB/GPW jeeps, although the driver's compartment had almost twice as many control levers: 2WD/4WD, hi-range/lo-range, capstan winch (on the bows), propeller deployment and rudder control with production starting in 1942. 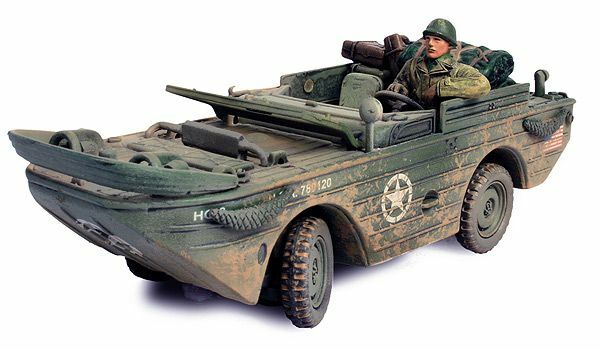 The Forces of Valor® U.S. Amphibian Jeep is based on a vehicle used by the 3rd Armored Division in Normandy in 1944. Please continue checking back, pricing and availability are subject to change. Additional information will be amended when it becomes available. We apologize for the inconvenience. Thank you! !